Our villagers for the month of January, a very special couple, are Lola and Larry Glass. They love Pine Run and we love them. Both contribute their talents to Pine Run. Lola plays the organ at Sunday services and Larry has been Villager Board Treasurer for 18 of the 19 years they have lived here. Lola was born in Danville, PA. Her mom, Evangeline, taught elementary school and her dad, Earle, was an interior decorator and had a store in Danville. Lola had two sisters, Lorraine and Virginia. St. Peters, their family church, needed an organist and since 15-year-old Lola was already proficient at the piano, the church paid for her to take organ lessons. Lola graduated from Danville High School and enrolled and graduated from Bloomsburg State Teachers College where she majored in elementary education. But it was after college that life really changed for Lola. 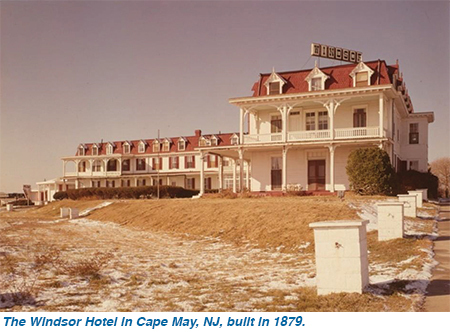 Almost like a movie plot, Lola decided she wanted to waitress for the summer at the Windsor Hotel in Cape May, NJ. She had never been to the shore before and her father objected to her going. That didn’t stop her. She met with a family friend, who happened to be the bank president, and borrowed $100 promising to repay the loan as soon as she earned enough to do so. He agreed and promised not to tell her dad. When Lola arrived at the hotel, the desk clerk, realizing that Lola needed help, offered to drive her to her rented room, a block away from the hotel. This nice, young man continued to look after her. He showed her around Cape May, the beach and the ocean and answered her questions concerning her job and the area. Oh, the young desk clerk was Larry Glass! Larry was born in Bryn Mawr, PA. His mom was named Salome but called Bunny by family and friends. His dad, Laurence, passed away the year Larry was born so Larry was raised by his mom and maternal grandmother. They believed that Larry should have both a good education and discipline so they enrolled him at the Waldron Academy and Malvern Prep School. 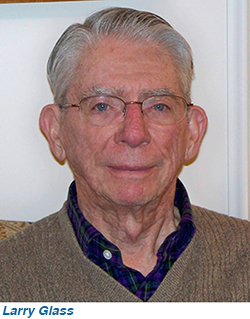 Larry graduated in 1947, attended Temple University for one year and then enlisted in the army where he spent four years in the Signal Corps in Communications. He was stationed in Anchorage, Alaska, at Fort Richardson, which housed army training films. Larry was in charge of the Army Central Film Library. Lola and Larry married in the summer of 1953 and they purchased a home in Hatboro. Lola taught first grade at Doylestown Boro School and Larry started as an expediter at Leeds and Northrup Instrument Co. Lola, because of her love of music, attended Westminster Choir College where she became proficient in conducting and teaching choir music. Larry took over his family’s investments as the only son and grandson, and retired from Leeds and Northrup. The Glasses have three wonderful children, Sandi, Beth, and Larry Jr. When the children were deemed old enough, they began taking family trips in rented Winnebagos. For three summers, they travelled across the U.S., providing, as Lola said, “a memorable family togetherness”. When the children graduated from college, Lola and Larry traveled on their own on Tauck Tours in the U.S. and Europe. 35 years. 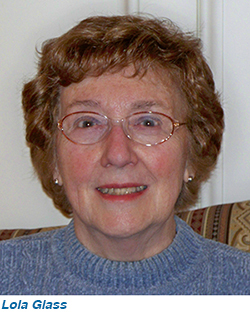 Lola was the organist and choir director at Doylestown Methodist Church for 18 years. In 1993, she was asked to fill in as director of the Pine Run Chorus because the chorus leader was leaving. A Christmas program’s success led to Lola being hired as the new director. A chorus of 12 became a well received chorus of 40. A village resident accompanist made it possible for the chorus to accommodate a great variety of guest groups and soloists. Another resident videotaped the programs which were replayed twice the following week on the Pine Run TV channel. The Glasses moved into Pine Run in 1998. They love their apartment, the folks here, think the food is great and love the location. They love their volunteer jobs and say that moving here was a wise decision. We wish them all the best in their years ahead at Pine Run.